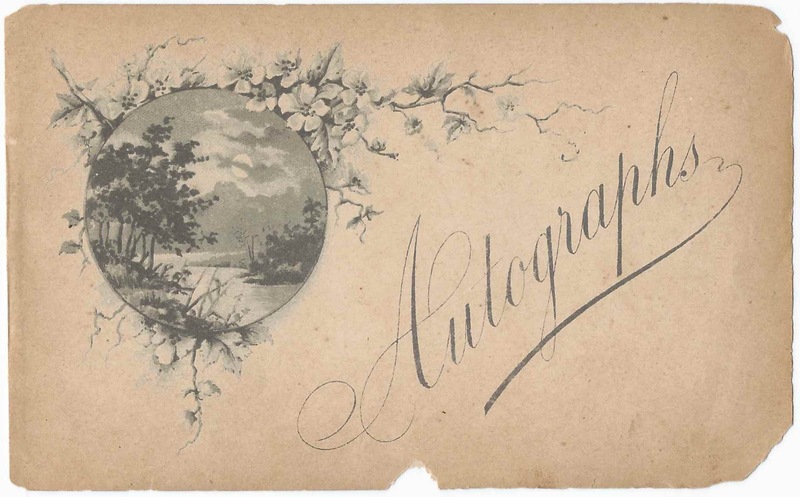 1887-1889 autograph album of Euphemia Dexter Hammond, "Phemia", of Mattapoisett, Massachusetts. She may have received the album at Christmas in 1887. 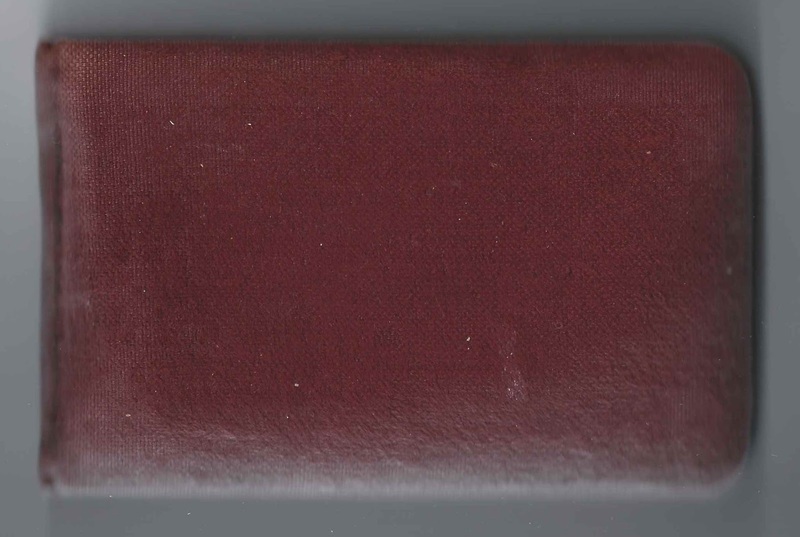 The album measures approximately 6" x 4" and contains the sentiments of over 50 of Phemia's relatives, friends and schoolmates. An alphabetical list of the signers, with any residence, relationship and school information included, appears at the end of this post. Several signers indicated they were students, perhaps with Phemia, at B.H.S., presumably Barstow High School. Euphemia Dexter Hammond was born 27 January 1873 at Mattapoisett, Massachusetts, the daughter of Charles Benjamin Hammond and Euphemia Frances (Dexter) Gifford Hammond, who were both born at Rochester, Massachusetts. Phemia's mother was previously married to William Clayton Gifford, with whom she had a daughter Lizzie Clayton (Gifford) Shurtleff. Lizzie and her husband, Gideon Shurtleff Jr. of Fairhaven, Massachusetts, signed facing pages in the album on Christmas Day in 1887. Phemia's sister Sadie Alton Hammond of Mattapoisett, Massachusetts signed a page in January 1888 and indicated she was a student at B.H.S. Other relatives, Hammonds and otherwise, signed pages in Phemia's album; refer to the list below. On 11 December 1890 at New Bedford, Massachusetts, Euphemia Dexter Hammond married Byron Pierce Dunn, son of Jerome Bonaparte Dunn and Laura W. (Champlin) Dunn. Byron was born 12 May 1866 at Fairhaven, Massachusetts. Before their marriage, Byron inscribed a page in Phemia's album, at Mattapoisett, Massachusetts on February 9, 1889. Phemia and Byron made their home at Mattapoisett, Massachusetts, and raised, I think, three children. If you have corrections and/or additions to the information above, or information on any of the signers listed below, please leave a comment or contact me directly. Thanks! Minnie B. Cannon of Mattapoisett, Massachusetts, signed on January 11, 1888, B.H.S. 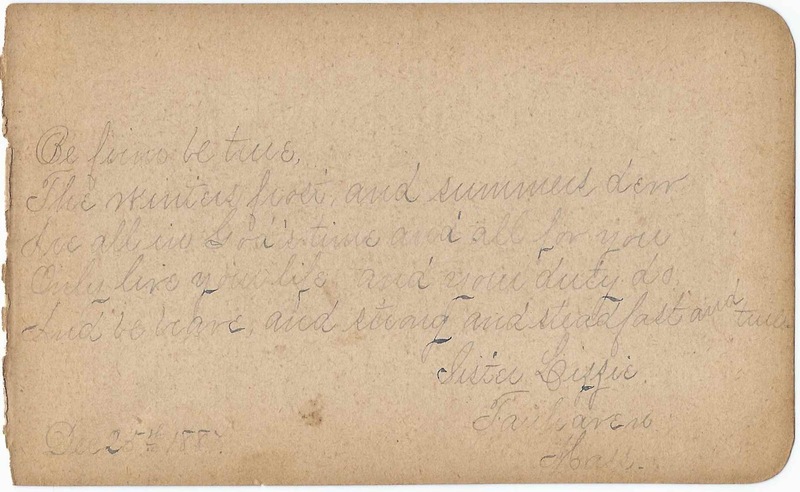 Grace L. Cole of Mattapoisett, Massachusetts, signed on January 10, 1888. Presumably Grace LeBaron Cole. Mamie Dexter of Mattapoisett, Massachusetts, signed on January 12, 1888; sketch of a sailboat. Lemuel LeB. Dexter of Mattapoisett, Massachusetts, signed at B.H.S. on January 10, 1888. He was Lemuel LeBaron Dexter, who would marry signer Clara L. Hammond. 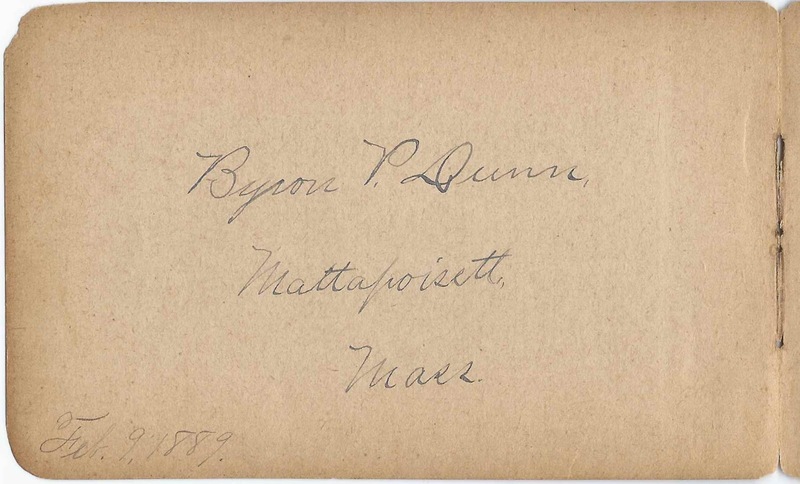 Byron P. Dunn of Mattapoisett, Massachusetts, signed on February 9, 1889. He was Byron Pierce Dunn, whom Euphemia Dexter Hammond would marry on December 11, 1890. 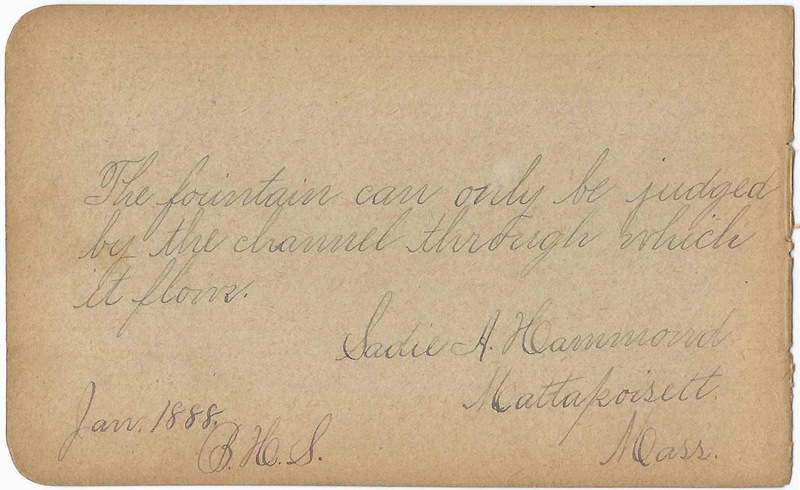 Sadie A. Hammond of Mattapoisett, Massachusetts, signed in January 1888; B.H.S. Sadie Alton Hammond was Euphemia's sister. Mrs. Emily Jane Hammond of Mattapoisett, Massachusetts, signed on July 27, 1888. 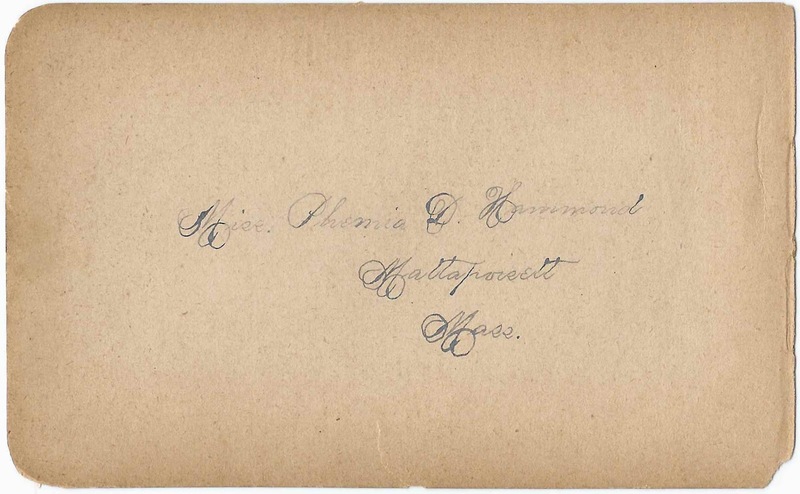 Roland Hammond, Jr., of Campello, Massachusetts, signed at Mattapoisett, Massachusetts, on July 16, 1888; Euphemia's cousin. His father, Dr. Roland Hammond, was a younger brother to Euphemia's father Charles Benjamin Hammond. Mrs. Eunice P. Merrihew of Middleboro. Eunice P. (Hitchmond) Merrihew, wife of Edmund Merrihew and daughter of Solomon and Eunice (Pease) Hitchmond. Ruthie D. Merrihew of Middleborough, Massachusetts, signed on May 25, 1888. Euphemia Dexter (Hammond) Dunn's aunt. Channie L. Shaw or Charmie L. Shaw of Mattapoisett, Massachusetts, signed on January 9, 1888, B.H.S. Not sure of given name. 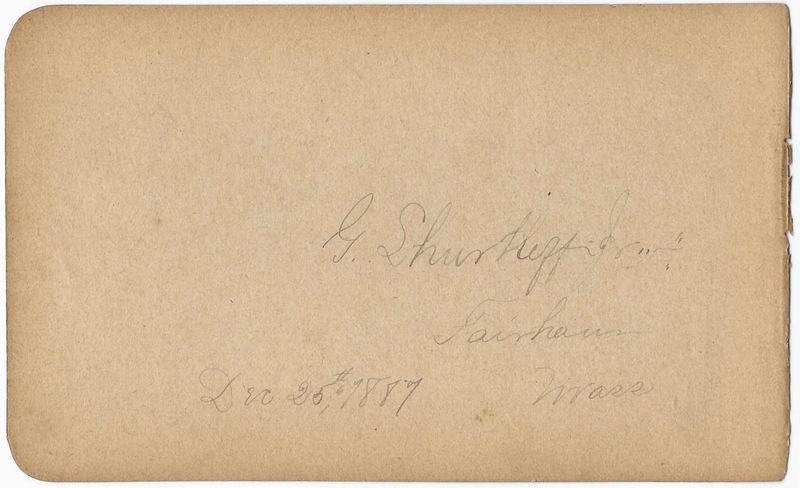 G. Shurtleff, Jr. of Fairhaven, Massachusetts, signed on December 25, 1887. Presumably Gideon Shurtleff, Jr., whose wife Lizzie Clayton (Gifford) Shurtleff signed the right facing page. Lizzie was Euphemia's older half sister. Sister Lizzie of Fairhaven, Massachusetts, signed on December 25, 1887. She was Lizzie Clayton (Gifford) Shurtleff, wife of Gideon Shurtleff, Jr., and daughter of Euphemia's mother Euphemia Frances (Dexter) Gifford Hammond and first husband William Clayton Gifford. The G. Shurtleff, Jr., who signed the left facing page, was presumably Lizzie's husband Gideon Shurtleff, Jr.